i share a lot with f2fb friend #297 ann malone. we both are in our fifties (although damnit, she’s three years older and looks ten years younger than me!) and we’ve both raised two sons. i felt really depressed on valentine's day because i thought my younger son eastman (f2fb friend #1) had forgotten about me. then the fedex guy showed up with a mushy card from eastman--it featured puppies and little candy hearts and who can't tear up when they see the combination? this is a valentine's card i received from one of my newest facebook friends talib who is from iraq where valentine's day is not generally celebrated. i appreciated the beauty of this card and the effort that went into making it! ann malone and i have been divorced and i think we both agree that our agoraphobia/panicattacks/anxiety contributed to that unhappy fact. and we both can remember every detail of our first panic attack. i was nineteen. i was grocery shopping at the kroeger’s across the street from the police and fire station in naperville, illinois. i was with my boyfriend keith. i was wearing white pants, white shirt, a tie, and a dark blue vest. i was carrying a backpack of books. wait? a tie? my attire that day did not reflect anything about my gender identification. 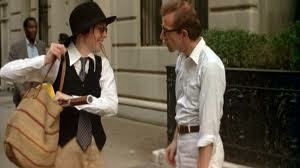 the 1977 movie "annie hall" starring woody allen and diane keaton influenced my fashion sense. so did the prices at the salvation army thrift shop where i bought my clothes. i sat the window sill at the end of the cash register waiting for my boyfriend to complete his purchases. i looked outside. a furious thunderstorm was coming. the thunderstorm made me think of anger–an angry mother, an angry universe, an angry God. this is like death’s arrival, i thought and i turned to look at the paramedic and two firemen waiting in line to pay for their lunches. “they can’t do anything to save me,” i thought. and suddenly, everything pressed in on me: the imminence of death and destruction, the explosion of my heart, the oxygen being sucked out of lungs, lights and sound slamming against me. too many things at once. i stood up. my legs were tingling with weakness. this is death, i thought. within a half hour, i was in edward’s hospital emergency room and a doctor was telling me i couldn’t possibly be having a heart attack. you don’t know that, you don’t know that, i thought. ann’s experience was a little different in details but the essence was exactly the same. today, we have the wonderful news that therapy, antidepresssants*, meditation, yoga**, natural remedies*** will the trick. uh, well, sometimes that’s true. and sometimes a study comes out that says no way. in any event, i was diagnosed with mitral valve prolapse, asthma, severe allergies, lupus, depression, separation anxiety. . . in the end, therapy teaches you to rely on your therapist, drugs to depend on your dose, yoga and meditation to rely on your guru of the moment. it’s a tough call as to what will set us free but ann and i both agree there is some truth to the adage that an agoraphobic only has one panic attack. everything else is the anticipation or the avoidance of having another. . . . she and i both avoided everything that might lead to a panic attack. i have never stepped foot in the kroegers in naperville since that day thirty two years ago and frankly, i still don’t like jewell or osco or “big box” grocery shopping. ann and i have both figured out what works for us, with the full knowledge that whatever we have cobbled together will fall apart and we’ll come up with new strategies. i admire ann and i’m so glad she’s my facebook friend! i got in the car, breathed deeply, and i aim further south to meet lionel richie. at least i think i’m meeting lionel richie. that’s what my next facebook friend’s profile picture looks like. and nobody, but nobody, would put up a profile picture that wasn’t taken yesterday at the passport photo shop, right? This entry was posted on Wednesday, February 15th, 2012 at 1:03 pm	and tagged with agoraphobia, annie hall, antidepressants, anxiety attacks, diane keaton, drug therapy for anxiety, facebook, friendship, meditation, woody allen, yoga and posted in Uncategorized. You can follow any responses to this entry through the RSS 2.0 feed. « eight pounds, four daughters, three sons, and many friends–what facebook gave me this year for valentine’s day! As Bernadette Birney suggests, yoga has always been about power, and with power comes responsibility for its trained, judicious use. Broad’s view is interesting but incomplete, as it leaves out all of the harm that could be done by business as usual in our modern world.